What Is The Silk’n SenseEpil Home Laser Hair Removal Device? 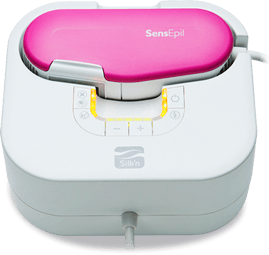 The Silk’N SensEpil™ is the latest in-home hair removal device to hit the market and is truly a one-of-a-kind product. The uniqueness of the SensEpil comes in the fact that it is currently one of only two laser hair removal devices to be approved by the FDA for in-home use. This all new device comes to us from the Silk’N Company and is sure to be a big hit due to it’s uniqueness, low cost, user-friendly design, and high rate of effectiveness. The SensEpil is small, portable, and uses special laser technology known as HPL™ or Home Pulsed Light. This HPL technology is especially important because the intensity of it is said to be similar to what you would see at a doctors office while getting professional laser hair removal treatments with the only difference being that its less painful. This means that consumers now have the opportunity to get professional grade laser hair removal treatments all from the privacy of their own home. The Silk’N SensEpil hair removal device is designed for use almost anywhere on the body. There are conflicting reports about it’s use on the face with some sources saying it shouldn’t be used due to potential harm to ones eyes while other sources say it’s okay as long as it’s used below the cheek line. Consulting a SensEpil owner’s manual would be the best way to clear up any confusion regarding use on ones face. Although still not officially approved for facial use many users have reported success in treating facial hair with the Sensepil. The SensEpil is a great innovation but unfortunately it is not for everybody. Currently this product only works on lighter skin tones. The laser technology it employs is not effective on darker skin due to it having more melanin. Beyond it’s lack of effectiveness is the painful side affects that result when it is used on skin that is to dark. These side affects include burns, blisters, and even hyper-pigmentation. Luckily though the latest version of the SensEpil comes with a skin tester that will alert you if your skin is too dark. You should consult our post regarding it’s potential effectiveness on your skin tone before purchasing it. Reports have shown the Silk’N SensEpil to be highly effective for most users over a period of several months. User’s should expect to go through several treatments cycles, each two weeks apart, before seeing extensive results. For some three or four treatments will be enough while others may need more. The SensEpil is available for sale in the United States for $499 $399 $199 and can be purchased online through several different retailers or direct through Silk’N. At $499 $399 $199 it may seem expensive but when compared to what you may pay for multiple visits to a laser hair removal center it is actually quite affordable. It is also important to note that the only comparable product, the Tria, now retails for about $1000 $449. If you are interested in the Silk’N SensEpil have a look around my site. I have provided a bunch of videos and articles to help you in your decisions about whether it is right for you or not. Also, if you are looking for a full and comprehensive post about the silk’n sensepil all on one page then I highly recommend you check out a very long and detailed review provide by beauty realty. Below is a set of before and after pictures from one person that used the Silk’n Sensepil on their underarms. These results are pretty astounding considering the inexpensiveness and ease of use. These results are suppose to by typical and similar to what most users will see. Will The Silk’n SensEpil Work With My Skin Color? The Silk’n SensEpil is a great and innovative product but unfortunately it does not come without limitations. The main limitation of the SensEpil, it’s inability to work with certain skin tones, is what I am going to talk about today. The SensEpil works best for those that have a light tone while it is harmful to those with dark skin complexions. For light skinned individuals it works normally while a dark complected person who uses it will experience burns, blisters, and potential changes in skin color (hyper pigmentation). Unfortunately for those with dark complexions there isn’t much of a solution. 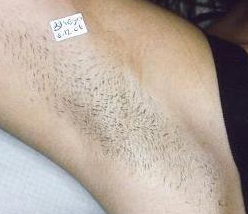 Due to a higher concentration of melanin darker skin just doesn’t respond well to laser hair removal treatments. Once you have the SensEpil you can use the built-in sensor to determine whether your skin is light enough for treatment. This is more applicable to those that know their skin is normally light enough but their current tan may have made it to dark. 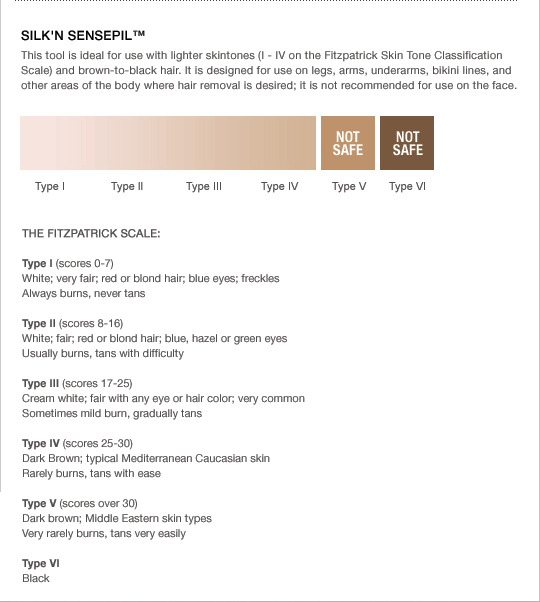 Those that are looking to purchase the Silk’n SensEpil should instead consult the Fitzpatrick Skin Tone Classification Scale below in order to see whether their skin is light enough for the Silk’n Sensepil. Where On My Body Can The Silk’n Sensepil Be Used? How Long Til I Can Expect To See Results From Silk’n Sensepil Use? Are There Any Side Effects To Using The Silk’n Sensepil? Can You Use The Silk’n SensEpil While Pregnant? Can Men Use The Silk’n Sensepil Home Laser Hair Removal Device? What Does My Silk’n Sensepil Purchase Include? How Painful Is the Silk’N SensEpil? Lisha on What Is The Silk’n SenseEpil Home Laser Hair Removal Device? © 2019 Silk'n Sensepil Home Hair Removal Reviews. All Rights Reserved. Theme By: RoseCityGardens.com.